As far as superhero-TV goes, the CW has been doing a pretty stellar job growing its empire of programming. Beginning with Arrow, and then the highly successful The Flash series, characters from each of these shows have been bonded together to form an even more highly anticipated spin-off series, Legends of Tomorrow. With big stars playing highly beloved characters from DC comics, it's not surprise that the show is expected by a vast majority to be a hit. At San Diego Comic Con, we sat down with the stars to talk about what's to come from the show, despite their having yet to film any of it. Brandon Routh is already a well-known name amongst superhero-media-loving fans, having played Superman back in 2007. But he returned to the genre as Ray Palmer/"Atom" on the CW's Arrow on which we see Ray go your ordinary, affable billionaire CEO to that of a super-high-tech-suit-wearing superhero. After a love affair with Felicity that ran its course, will Ray be set to find love on a whole new show? Or perhaps his attention will be more so fixed on becoming legendary alongside his new crime-fighting team? Victor Garber is arguably the most renowned of the actors on the show. He's also no stranger to fan-favourite television series, having spent five years on the hit JJ Abrams series, "Alias." But now he's ready to take on the next challenge, that of playing (half of) Firestorm on "Legends of Tomorrow." He says he's realistic enough to not presume that the show will be the smash-hit everyone expects it to be, but speaks highly of his fellow cast-members whom he is greatly looking forward to working with. He also offered up insight on just what drives Martin Stein as a person, citing his love for his wife as "paramount." Wentworth Miller has been busy stealing scenes on "The Flash" as Leonard Snart/Captain Cold and is delighted to be reunited with his "Prison Break" co-star Dominic Purcell, whom he reveals got cast on the show after Wentworth himself recommended him for the part. He is still developing the physicality and mannerisms of Snart but has already put great thought into these elements of the character, and has theories of his own on just why it is that Captain Cold is the only villain with whom Barry Allen has been able to collaborate with thus far. Ciara Renée may be the biggest newcomer of the group, having only been seen in a cameo in the season finale of "The Flash" as opposed to having a proper character introduction like the other cast members present at SDCC, but she is more than ready to get started on the show. She's bright, energetic, and can't stop smiling over how excited she is to be on such an anticipated show with a thoroughly stacked cast. She's a fan of superhero media and has done great research to prepare for the role, and of all established characters on "Arrow"/"The Flash," she's most hoping to work with Candice Patton, eager for them to make friends. Caity Lotz didn't know at first that Sara Lance's death wouldn't stick, but she's plenty thrilled to be back in the swing of things as White Canary. She knows there's bound to be some drama kicking off once Sara's friends and family learn of her resurrection but Lotz is looking forward to playing out these reunions as well as all the new material to come on this series. Dominic Purcell is entirely grateful to Wentworth Miller for having recommended him for the part of Mick Rory/Heat Wave. Not only does he adore having the opportunity to work with Wentworth again, he's greatly looking forward to acting alongside Brandon, whom he has nothing but the highest, profanity-laced praise for. He also thinks it could be fun to play more heated scenes alongside Golden Glider (we explained to Purcell that this is the super alias of Lisa Snart), because of how mad it's likely to make Captain Cold. 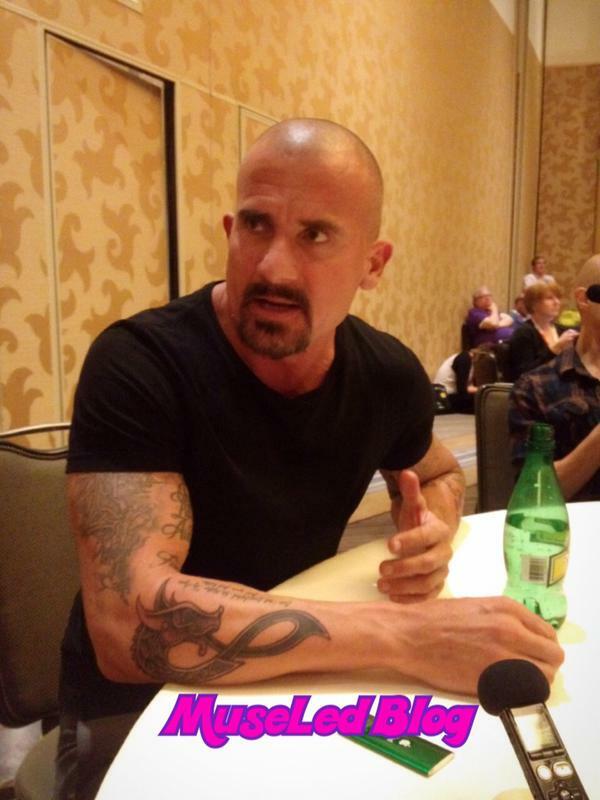 Ever the trouble-maker that Dominic Purcell! Legends of Tomorrow will have a mid-season premiere in 2016 on the CW.